Quantity: 100pcs. Size : 4cmx3cm. High quality in EU and US quality standard Material: paper conversion : 1 inch = 25.4mm or 1mm =0.0393inch size of card: 44*31mm Quantity: 100pcs Colour: white condition : brand new. Quantity: 50pcs. Material: paper. NOTE: the product in the picture maybe larger than actual one. Covered with velvet. Hair Care & Salon. 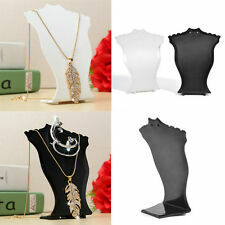 1 x Necklace display holder. Jewelry & Watches. Fashion Jewelry. Ladies Jewelry. Jewelry Findings. - Material: Paper board. 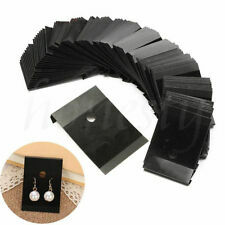 100 x Earrings Ear Studs Holder Display Hang Cards. 100 PCS Plastic Earrings Ear Studs Holder Display Hang Hanging Cards 30 x 40mm. 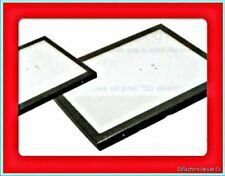 Professional type plastic earring display hang cards. We'd like to settle any problem in a friendly manner. Note: Light shooting and different displays may cause the color of the item in the picture a little different from the real thing. Color: White. Material: Plastic Paper. Material: Kraft paper. Fashion Jewelry. - Style: Cat. Health & Beauty. Jewelry & Watches. Ladies Jewelry. Jewelry Findings. Tattoos & Body Art. Material: Kraft Paper. 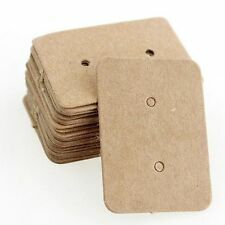 100X Jewelry Earring Ear Studs Hanging Display Holder Hang Cards 2.5cmx3.5cm. 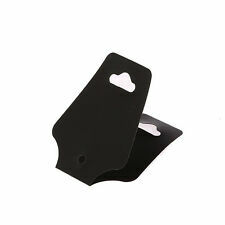 Professional type plastic earring display hang cards will hang on any rack made for earring hang cards. Quantity: 50pcs Material: paper size : 9cmx5cm Condition: Brand New High quality in EU and US quality standard converse : 1 inch = 2.54cm or 1cm = 0.393 inch NOTE: the product in the picture maybe larger than actual one, Please check the size before bidding !!!. 5Pcs Clear Acrylic Perspex Sturdy Jewellery Display Riser Set Stand Showcase 4mm. 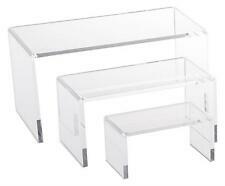 5Pcs Set Acrylic Perspex Riser Display Stand Jewellery Shoes Counter Showcase. 6Pcs Clear Acrylic Perspex Display Jewellery Riser Set Stand Showcase 4.5mm. 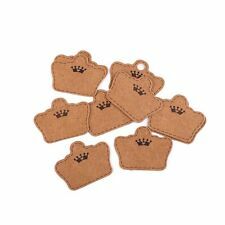 DESCRIPTION Quantity: 100pcs Material: paper size : 3.1*4.5cm Color:black Condition: Brand New High quality in EU and US quality standard converse : 1 inch = 2.54cm or 1cm = 0.393 inch. Quantity: 100Pcs. 100 PCS Plastic Earrings Ear Studs Holder Display Hang Hanging Cards 30 x 40mm. 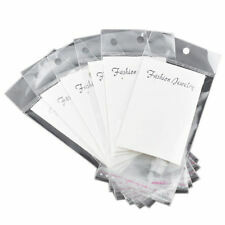 100 x Earrings Ear Studs Holder Display Hang Cards. Professional type plastic earring display hang cards. Add a beautiful finishing touch to your gift. Material: Paper card. Colors: Black. Due to light and monitors effect, color difference may exist slightly. respond within 24 hors and give you a satisfying solution. 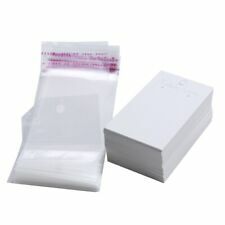 DESCRIPTION Quantity: 100pcs Material: paper size : 3.1*4.5cm Color:white Condition: Brand New High quality in EU and US quality standard converse : 1 inch = 2.54cm or 1cm = 0.393 inch. 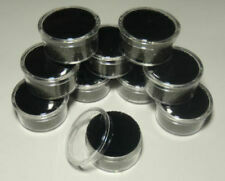 This is a new set of 6 black foam ring display tray insert pads that holds 72 rings. 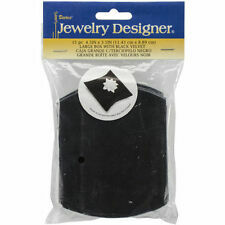 6 Ring Display Pads 72 Slot Jewelry Insert. The top of the foam pad is black felt. Its great for showing your sample line. Material: Paper card. Colors: White. Due to light and monitors effect, color difference may exist slightly. respond within 24 hors and give you a satisfying solution. 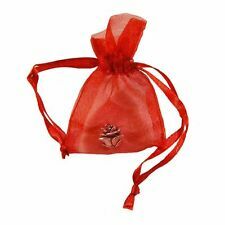 Quantity: 100pcs Material: paper size : 2.4"x4" (6cmx10cm) Condition: Brand New High quality in EU and US quality standard converse : 1 inch = 2.54cm or 1cm = 0.393 inch NOTE: the product in the picture maybe larger than actual one, Please check the size before bidding !!!. Add a beautiful finishing touch to your gift. Material: Paper card. respond within 24 hors and give you a satisfying solution. Due to light and monitors effect, color difference may exist slightly. Bead Vise Great for Jewelers & Holding Beads. This is a new bead vise. 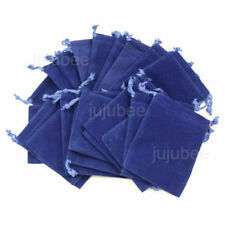 Condition: Brand new and good quality Color: As the picture Material: Paper Size:122*77mm Quantity:100pcs. Style: Pineapple. - Material: Kraft paper. Jewelry Findings |Health & Beauty |Wedding Decoration |Sports and Outdoors |Jewelry & Watches |Clothing, Shoes, Accessories |Other. Quantity: 100pcs Material: paper size : 9.3*4cm Color:white Condition: Brand New High quality in EU and US quality standard converse : 1 inch = 2.54cm or 1cm = 0.393 inch. Material:Paper Plastic Size:9cmx5cm 15cmx6cm Color:White Quantity:100Sets Packaging content:100 set earrings Decorations paper card with Self-adhesive bags Note: Light shooting and different displays may cause the color of the item in the picture a little different from the real thing. The measurement allowed error is /- 1-3cm. Brand Unbranded MPN Does not Apply EAN 192090186716 UPC 192090186716 ISBN 192090186716. 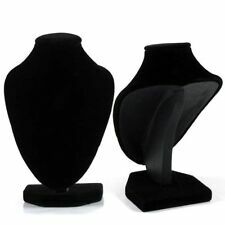 This is a luxury Necklace Jewelry Pendant Chain Display Stand Holder. Covered with velvet. Material: Paperboard Velvet fabric. Also great as a gift. Unique design and fashion style. Color: Black. Professional type plastic earring display hang cards. 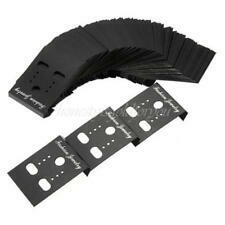 Three pairs of holes in each card, will ensure that you can fit just about any kind of pierced earring on the card. Color: Clear. Material: Plastic. 100x Earrings hanging cards. Perfect for displaying earrings. We'd like to settle any problem in a friendly manner. We want to make sure you are happy with our item. Goods without RMA number will NOT be accepted. LOT OF 100 WHITE < STERLING SILVER > EARRING CARDS HANGING JEWELRY CARDS 2" x 2"
LOT OF 100 BLACK < STERLING SILVER > EARRING CARDS HANGING JEWELRY CARDS 2" x 2"
LOT OF 100 WHITE PLAIN EARRING CARDS EARRING JEWELRY CARDS 2"x2"